Please visit our Budweiser Stage pages for information, show schedules and tickets. Molson Canadian Amphitheatre is a partially enclosed/partially outdoor concert venue in Toronto, Ontario. A variety of music events are held at this venue, from pop concerts to jazz ensembles. 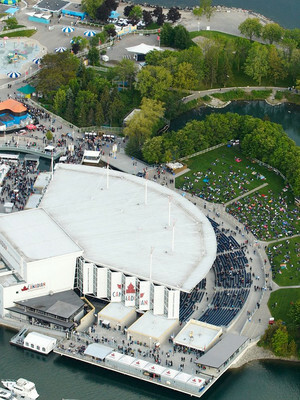 The Molson Canadian Amphitheatre won the RPM Magazine's "Best New Concert Venue" award in 1995. Due to the venue being partly outdoors, it is open from May to September each year.